Change your hairstyle from pith less and limp to blasting volume with this essential fashion accessory; the Clip-In Weft Set! Quickly and comfortably apply lustrous length, volume and color. 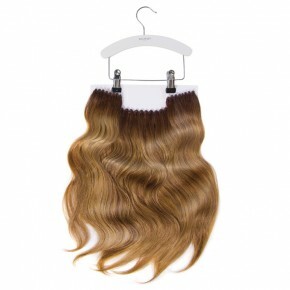 Featuring the patented Soft Blend Edge, the Clip-In Weft Set glorifies your hair in just 5 minutes. You can now have the voluminous, long and flowing locks you’ve always dreamed of. The Clip-In Weft Set (40 cm) contains 5 strips of hair extensions which can be clipped in easily and result in a perfect natural and voluminous look. Hairpieces made of 100% Human Hair are manufactured using the best quality hair, also known as Session Hair. Session Hair, developed by session stylists, is a special blend of fine and thicker hair. The ombré colors blend brilliantly into any natural hair. Read more about Human Hair. Use: Start by making a parting in the neck area and put your natural hair up. Clip the first strip (13 cm) in and cover it with a layer of your natural hair. Place the next strip (20 cm) approximately 2-3 cm above the first strip. Repeat this with the last long strip (25 cm). Use the two smallest strips to lengthen and volumize the sides and place them where you need the most volume. Finish with putting the top layer back and comb your hair over the strips, for a perfect invisible integration. Use as many strips as you need, depending on the size of your head and the desired length or volume. Backstage secret: Tease your hair a bit before you clip the extension in, this ensures an extra firm, secure grip.